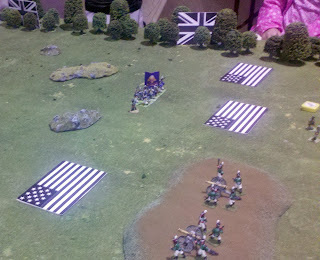 Our recent local game convention fell on the 200th anniversary of the War of 1812 2nd Battle of Lacolle Mills, so I recreated it on the tabletop using Too Fat Lardies’ Sharp Practice rules. 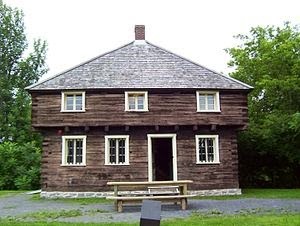 The battle occurred at Lacolle, Quebec, near Lake Champlain, about 5 miles north of the modern US/Canadian border. A US force of 4000 bombarded a British held blockhouse, with the plan to assault it. The blockhouse was held by only 80 troops from the 13th (1st Somersetshire) Regiment of Foot. The British in the blockhouse held out valiantly, with Royal Marines firing Congreve Rockets back at the Americans, while a number of other units marched to their aid. In my game, I set up the board with a “blockhouse complex" at the far end to draw the US players’ attention and told them the British were regrouping from unsuccessful attack on the artillery and to deploy expecting another attack from that direction. The US forces deployed evenly across their front, with this in mind. 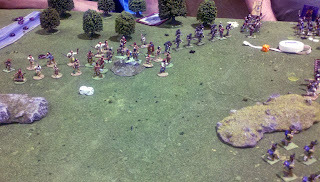 But once deployed, as in the historical battle, the Canadian/Native Canadian forces appeared on their flank. 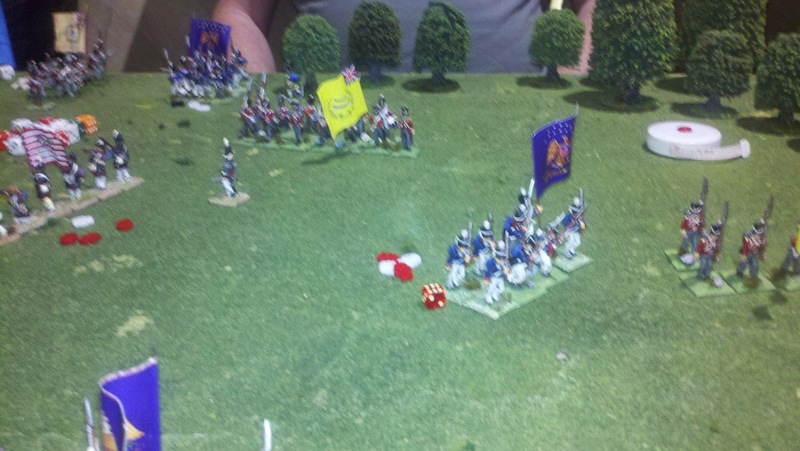 The Canadian force appeared piecemeal, & at random places along the flank, so their attack wasn’t completely coordinated. 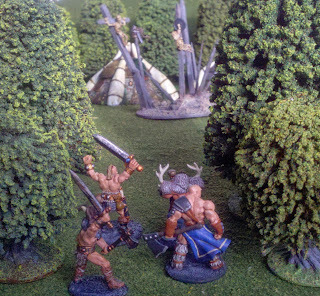 & once deployed, they used the woods as cover for most of the battle. The US forces were quickly spotted by the Canadians and forced to deploy off blinds. Finally, a Canadian unit made a break for the US artillery, but the US Rifles and other line units quickly turned their firepower on them and cut them down. It was then the Canadians turn to return the favor. 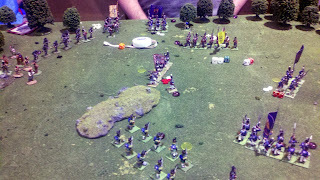 The 2 US units on the right flank that had been taking the brunt of the Canadian fire finally started to waver and fall back. It was at this point that the Native Canadian allies made themselves felt. They played a bonus card to enable them to make an extra move, fired into the rear of the US Rifles causing significant Shock, and let loose a blood curdling War Cry (bonus card) which caused another wavering unit to break. 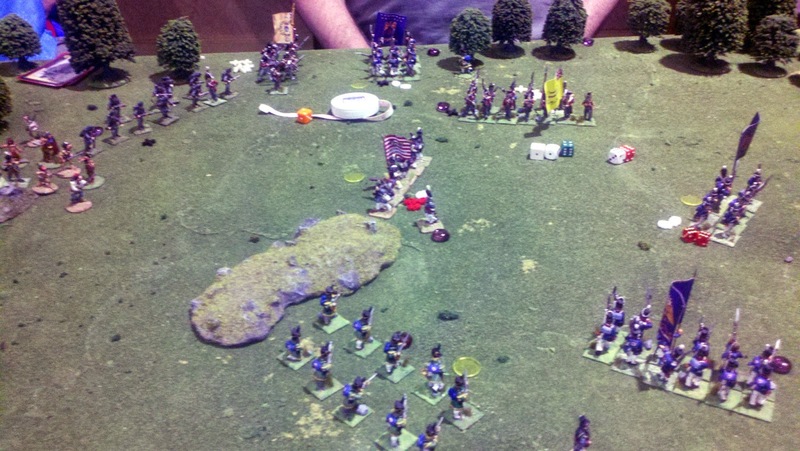 At this point, there were only 2 untouched US units with good morale between defending the artillery, with a number of healthy Canadian and Native Canadians bearing down on them, so we decided to call the game. Everyone seemed to have fun, in spite of difficulties arising from my less than clear explaining these somewhat detailed rules. But now that everyone had a basic understanding of the game under their belts, they are all eager to try the rules again. Historically, British gunboats moved upriver to fire on the Americans. The flank companies of the 13th were nearby and mounted an assault on the US artillery, but were driven back by sheer numbers. Finally, the Canadian Voltigeurs, the Gredadiers from the Canadian Fencibles, and Native American allies flanked the artillery position and caused many casualties to the artillery crews and command. 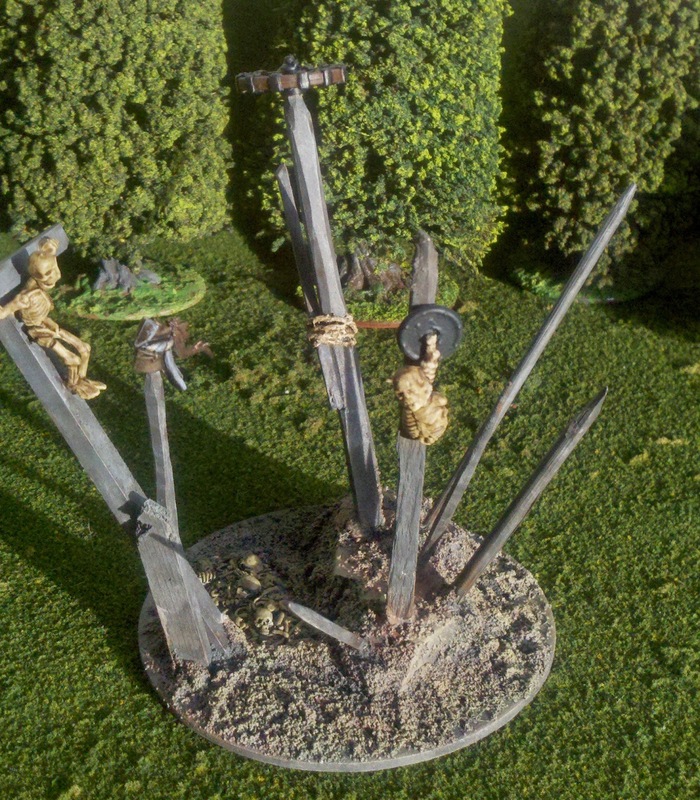 Some accounts have this flanking force taking the guns and spiking them before being driven back. Ultimately, the US heavy artillery was unable to deploy due to the soft ground, and the remaining artillery was not heavy enough to breech the blockhouse after hours of bombardment. The US attack was a complete failure and was yet another blank mark on the US commander’s military career. 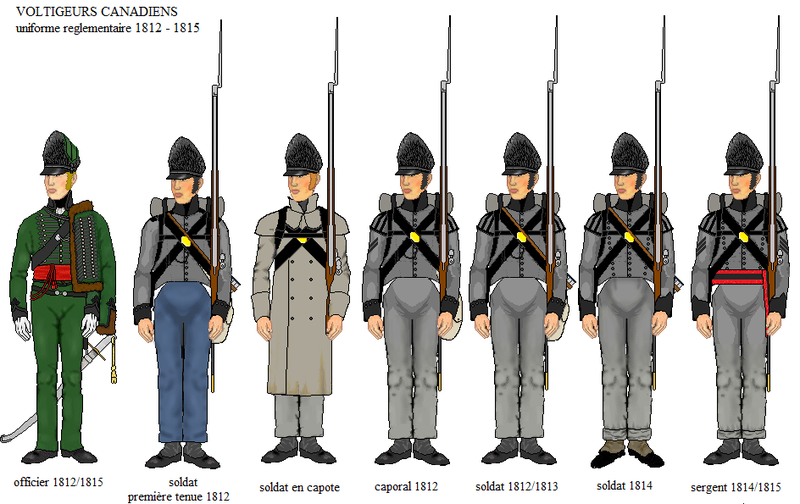 Finally, here are the Canadian Voltigeurs conversions I did. 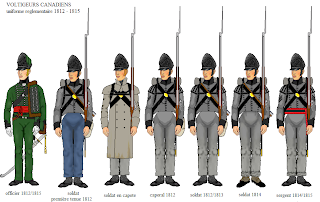 Luckily, their later uniform was similar to the British Rifles uniform. So I only had to carve the epaulettes off their shoulders and putty up their shakos to turn them into the Voltigeurs' distinctive bearskin shakos. Since there might be a few questions, I wanted to review my dungeon making process. I was directly inspired by OldBen1’s excellent “dungeon/house in a box idea”: Joseph Curwen House, LotR Dungeon. 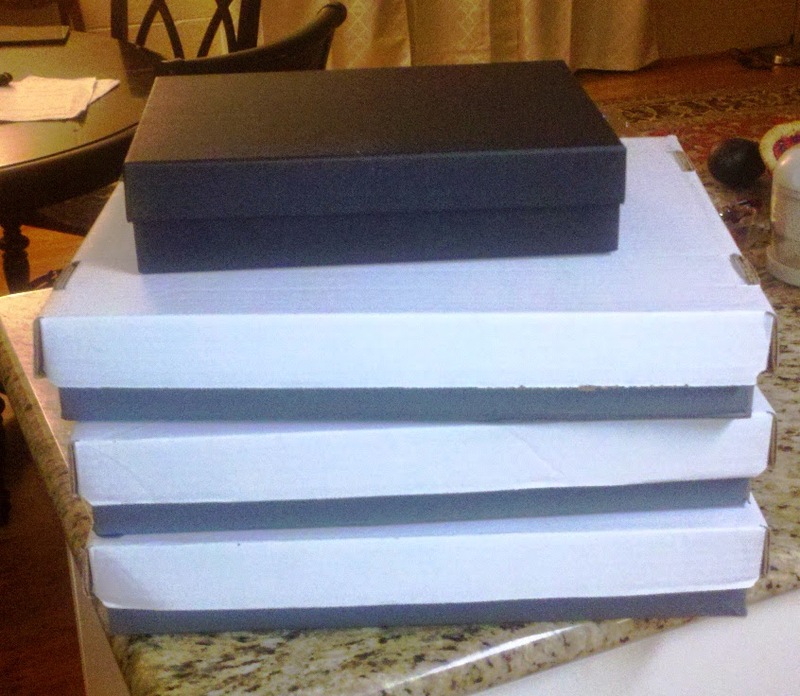 Since we recently moved & had a bunch of banker’s boxed left, I used those as the frame for the larger rooms. 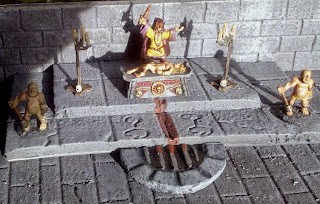 The medium sized room is 1 banker box, & the altar room is 2 boxes side by side with 1 side cut off. 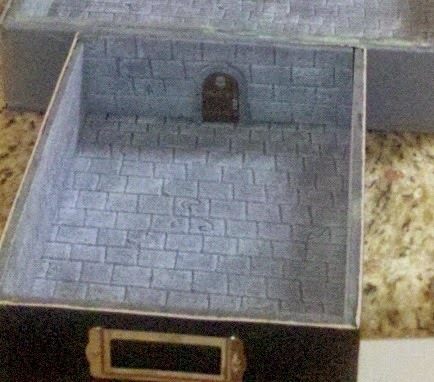 The smaller entry room was a picture storage box from Michael’s. The floors and walls are made from a thin insulation foam called GreenGuard. 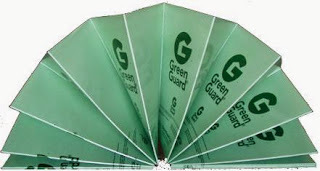 I got some from a gamer friend who works construction, but I’ve not been able to find it in a retail store yet. The foam is about 1/4" & has a thin film on both sides. I peeled the film off 1 side & used a dull pencil to draw the brick patterns and designs. The foam is dense enough that it’s easy to draw on and holds the marks well. The foam is denser than normal foam core and cuts a lot easier. I’ve found similar thin insulation foam on the websites of big name home improvement stores, but I've heard that foam isn't as dense. I haven't checked this myself. I put a quick layer of white glue on the foam to seal it & then spray painted it grey followed by lots of drybrushing. I used double-sided carpet table to tape the foam into the cut down boxes. 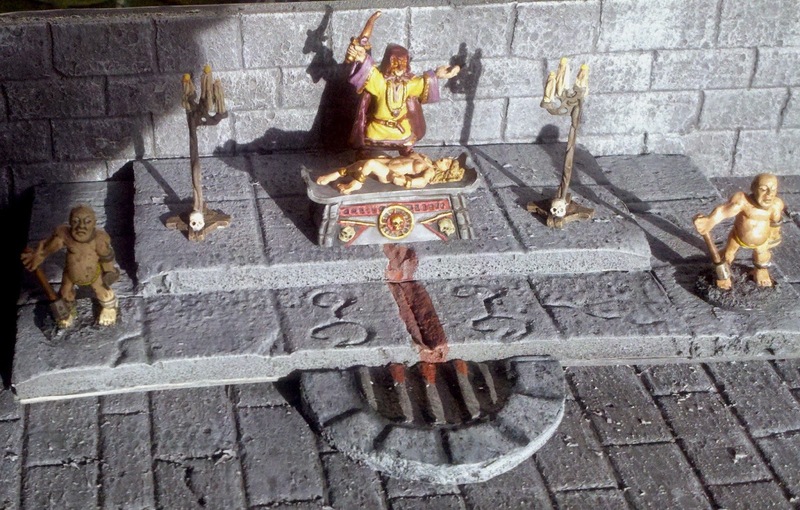 The altar and grate in front of it are also made out of the GreenGuard, so the possibilities of further dungeon detailing like custom doors, pit openings, archways, etc. are endless. 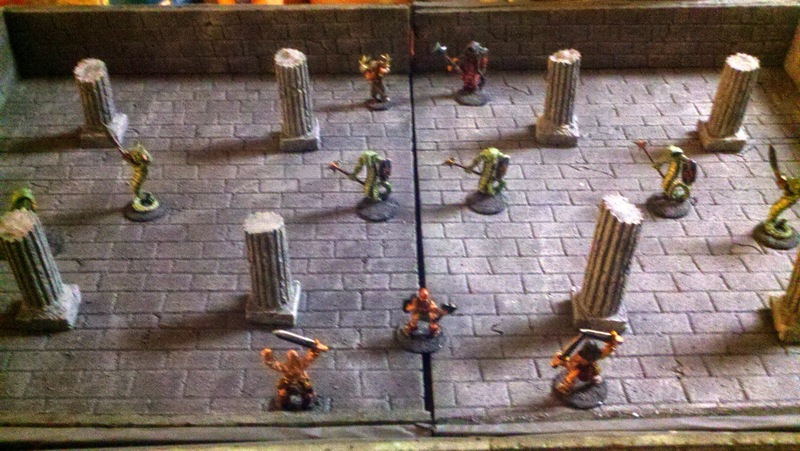 The doors that I used were from Mage Knight Dungeons. & finally, one of the nice things about using these boxes to build the dungeon is that they already have lids, so they’re very easy to store. Here are all the rooms boxed up. 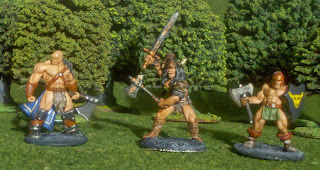 Here are better views of the figures I painted up for the Crom game. 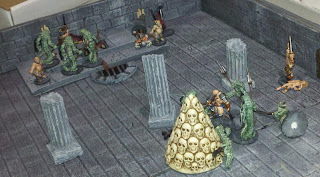 I will probably post later about the building of the dungeon rooms. What is best in life? 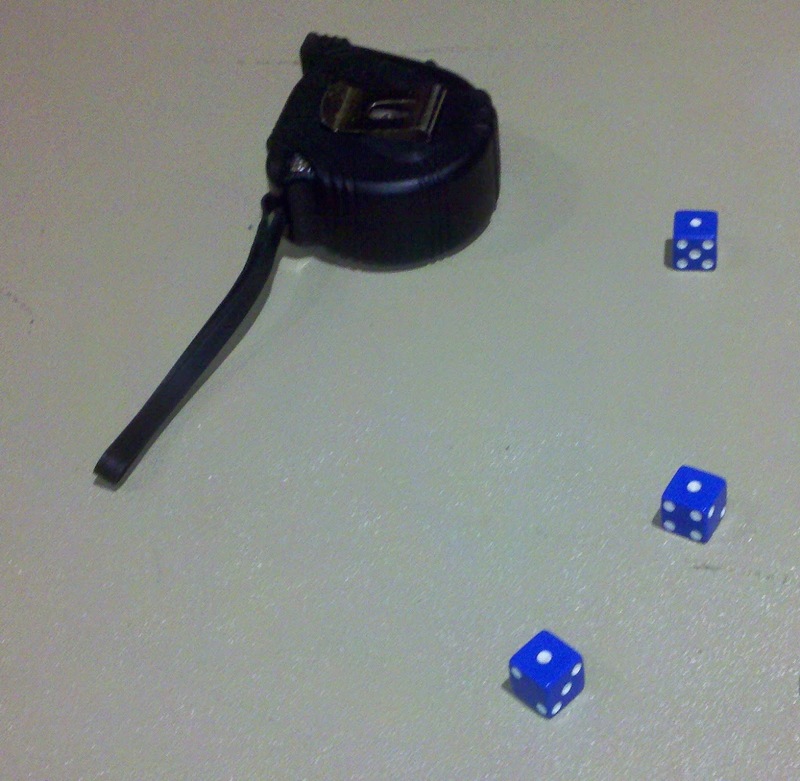 To crush your opponent, see their dice driven before you, and to hear the lamentation of their figures. Will your non-IP Infringing fantasy heroes save the girl before the evil magician can enact his nefarious plan? I ran a game of Crom at our local gaming convention, a fantasy skirmish game based in the Conan the Barbarian world. 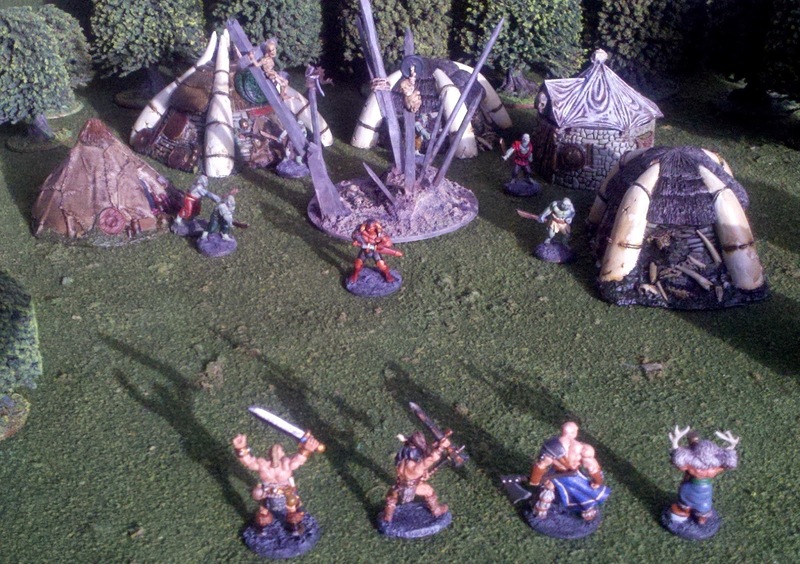 The rules are from Matakishi, of Matakishi's Tea House, and can be purchased from Wargames Vault. It was a classic story of thieves steal jewel, brag too much in tavern, get thrown in jail, & get made an offer they can’t refuse. The magistrate’s daughter was captured by Snake Cult: Local #623, so the jewel thieves were offered amnesty for their crimes if the daughter was saved. And off they went to find said cult. 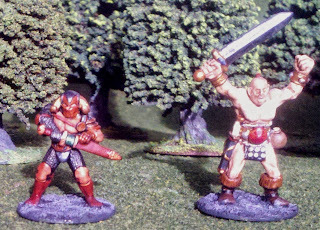 The party was made up of Krognar, Sandor (no relations to the Westeros Cleganes), Gutrecha and Dave the Barbarian. They moved stealthily up on the Snake Cult’s outpost. The party encountered some guards on the outskirts of the camp which they quickly dispatched. They moved towards the Cult’s huts in which they had to find a key to open the temple’s main door. 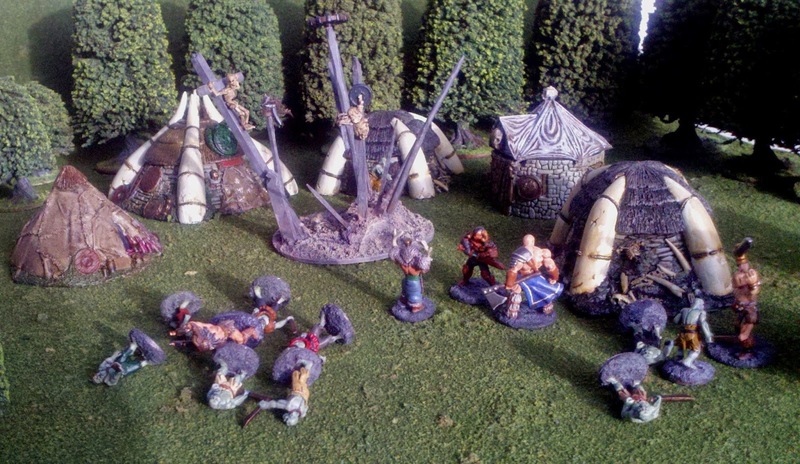 But more cultists came pouring out of the huts and the party met the Death Dealer. 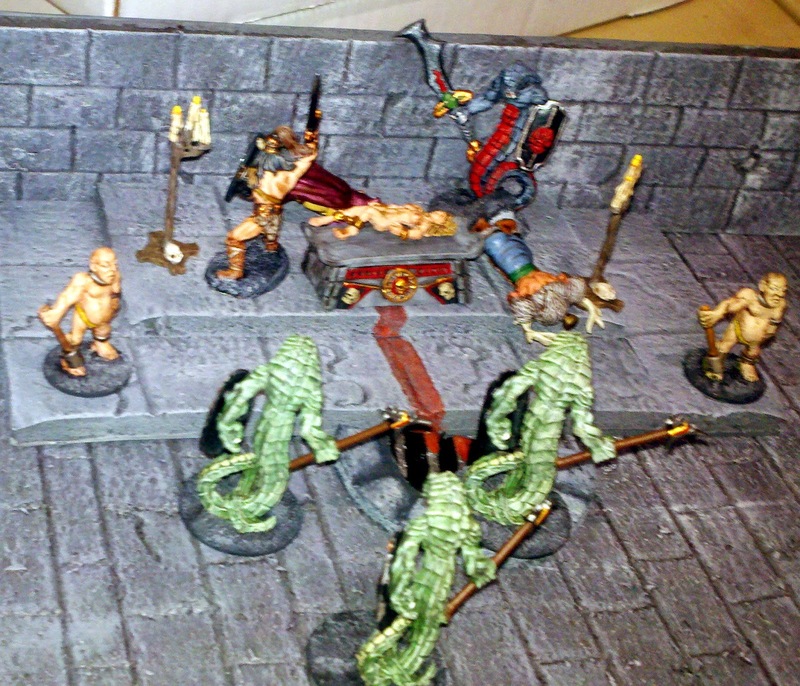 They overcame the final resistance, but Gutrecha was finally killed with dead cultists piled all around him. 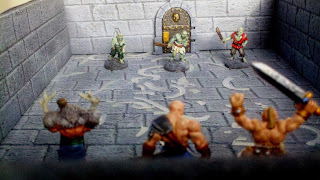 Luckily the rest of the party found the key, and released another hero, Gonad, that had been the Cult’s captive (conveniently replacing Gutrecha). 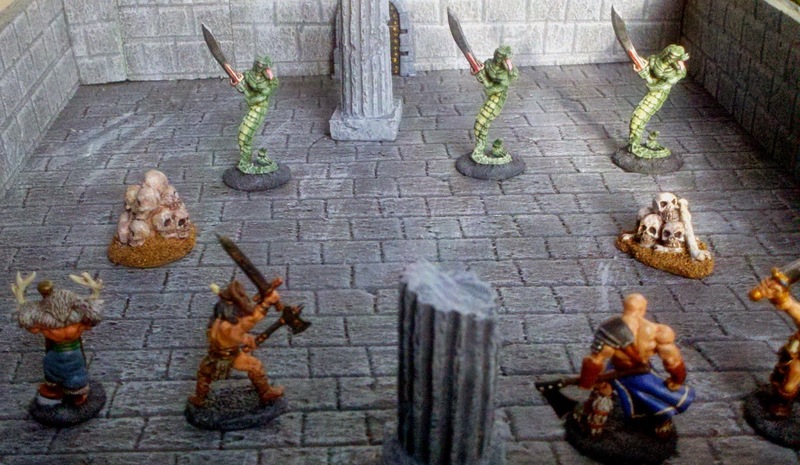 So, healed up and ready to go, the party delved into the depths of the Snake Temple. 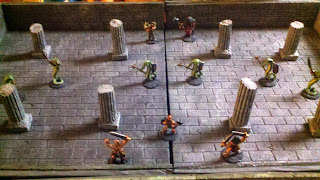 Once inside the temple, the party was immediately attacked by more cultists, and they were able to handle them easily. 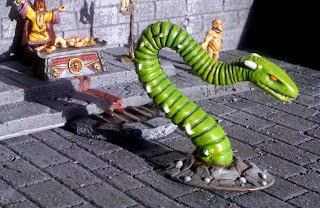 But the party noticed a number of very large snake skins lying around the room, which made them very cautious. Advancing into the next room, they found the skins' owners. And found that they were noticeable tougher than the generic cultists. 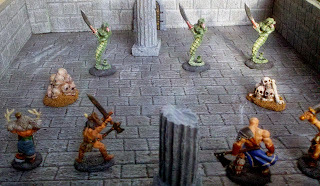 They still overcame the snakemen. They were leery of what the next room might hold, but heard voices raised in blasphemous chanting, so knew they must hurry to save the girl. Once they opened the next door, they knew they’d reached their destination, but also that at least some of them would not get out alive. 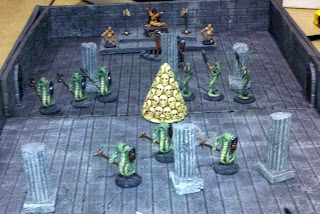 The snakemen tried slithering forward, but the temple seemed to too cold for their reptile blood (the snakes consistently rolled low movement rolls). The party still had great difficulty dealing with so many snakemen at once. Finally, Krognar had a brilliant idea (for a barbarian). Killing the priest would stop the ritual, so he rushed forward, weaving between the slithering attacks, and stuck the priest down in one blow. Unfortunately, Krognar brilliance hadn’t provided him an idea of what to do now that he faced the Naganator. Krognar's dying attack held the Naganator off while Dave ran forward to release the magistrate’s daughter. But remaining snakes were too much for the heroes and they were all cut down. 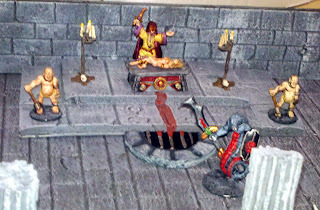 So, in the end, the heroes were not only released from the magistrate’s jail, but the Snake cult also released them from the mortal coil. The game was a lot of fun to run, largely because of the great players who got into spirit of the game.